June 2017 will be remembered by South Africans for decades to come. A historical moment when Mother Nature showed her true power and the only option was to get out of her path and watch in awe. For a week preceding the fire, extreme weather warnings had been issued with predictions of flooding in drought stricken Cape Town and surrounds and rain and strong winds in the Garden Route. Waking up on the 7th June, little did anyone know that within 72 hours 10,000 hectares and in excess of 500 structures in the Garden Route would be burnt, some houses simply reduced to a heap of rubble and vast swathes of pine plantations burnt. While fires are not uncommon in the Garden Route, this fire had all the conditions to make the ‘Perfect Fire’, something that thankfully occurs only every 100 years. With hindsight being a perfect science, understanding the fire has produced insight into the elements that created this inferno. The speed of the wind. Each of these conditions would contribute to a fire, indeed the combination of two or three conditions would generate a terrible fire, but the combination of all five factors produced a historical fire. Looking at each factor and how it contributed to the perfect conditions will assist in understanding the mechanisms and how to plan to mitigate escalated damage in the future. The Garden Route, along with the rest of the Western Cape has been in the grips of a severe drought for 12 months. While Cape Town exhibits an established winter rainfall, the Garden Route between Mossel Bay and Storms River do not. Contrary to popular belief, the Garden Route does not have a rainfall season. The impact of the current drought on vegetation and the resultant increase of fuel for a fire has been substantial. One drought survival mechanism of plants is to reduce the surface area of trans- evaporation, or simply put, to defoliate and drop leaves. The defoliation can represent up to 40% of the trees leaf mass. With the accumulation of extra leaf mass, the usual systems of decomposition by both chemical (fungal) and mechanical (earthworms, crickets, Pill Millipedes etc.) means is retarded and thicker layers build up. This build up in areas can result in the formation of natural compost heaps. Normal composting is an exothermic process reaching internal temperatures between 45 and 77°C. Under certain conditions a compost heap can spontaneously combust. Alone, the additional leaf litter and potential compost heaps has a potential for starting a small fire, or series of fires. 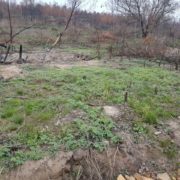 It is important to understand the different vegetation types in the Garden Route to appreciate the contribution to the build-up of flammable material for fires. Everyone speaks of the Knysna Forest and the Fynbos in the Garden Route. However, we also have pine plantations, alien stands, coastal thicket and Milkwood Forest. Also, we have agricultural practices which comprise crop production, orchards and pastures for dairy and livestock production. The importance to distinguish each of these vegetation types is that each has a different contribution to the progression of a fire, some retarding fire and others fuelling fire. The Afro-montane forest, as a natural stand is fire retardant with the border species preventing the spread of fire to the interior of the forest. This has evolved as a means of protection against the fire climax vegetation of Fynbos. Milkwood forest is also fire retardant which can be evidenced on the eastern end of Lake Pleasant where the fire was stopped dead in a straight line by this vegetation type. Coastal Thicket is in some part fire retardant, but the leaf litter, when dry, and dead branches burn and smoulder. While not completely stopping a fire, can slow the progress of the fire down. The biggest danger of this vegetation type is the potential of flare up after the main fire has stopped. Then there is Fynbos. Every South African knows the fires of Fynbos. Fast, furious, extensive and most times unstoppable. Fynbos, is a fire climax vegetation and needs fire. There is no exact frequency period of a burn, but it does need to burn. Not burning it has two results. Firstly the build-up of flammable material and secondly the intrusion of either coastal thicket or forest species. The Goukamma Nature Reserve east of Sedgefield has not had a burn in 30 years except for a small portion near the Goukamma River which was burnt in 2006. It was primed with fuel for a fire and was completely burnt during this recent fire. Pine and Eucalypt plantations are also prone to burning. Depending on the age and maintenance of the plantations the leaf litter layer can build up and add to the fuel base for a fire. Representing the largest surface area burnt in this fire, the contribution as fuel of the mosaic of plantations has to be addressed. Finally, the gradual intrusion of alien vegetation, which burns readily, in the form of extensive stands of Black Wattle has also contributed vastly to the provision of fuel to the recent fire. 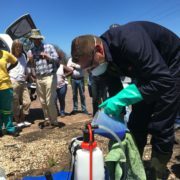 The collection of fuel biomass from pine plantations, alien stand and a fynbos without partitioning corridors of fire retarding forest was a major contributing factor in the rapid spread of the fires. Ask any old farmer or fire fighter where to run to when a fire gets out of hand and they will all direct you to the kloofs. This is not random advice, but the wisdom of experience. Fire likes to race up slopes and along ridge lines, bypassing gorges. The Elandskraal fire did exactly that, twice splitting along ridge lines and then joining up again. A good indication of the traditional fire paths, because the vegetation has been controlled by fire for millennia, is to check the vegetation that prevails. Again, if Afro-montane Forest occurs naturally in an area, then the chances are that fire has not travelled that way in the past and is unlikely to do so in the future. Dendrochronological studies from trees in the Afro-montane forest lack any clear seasonal growth patterns in their growth rings which indicate a lack of a clear and defined rainfall in the region over a time frame that extends back at least 650 years. The relevance of this distinction in rainfall patterns is important when weather predictions indicate heavy rain and flooding in Cape Town. When a winter storm is predicted for Cape Town, the anticyclonic weather mechanisms of the southern hemisphere will result in the pressure system veering north east from Cape Town and passing slightly north of the Garden Route. This deflection north of the Garden Route creates a north westerly wind into the region which results in hot dry air known as a Berg Wind. Depending on the state and strength of El Nino and La Nina conditions, the degree of deflection of the pressure systems varies and can create a period of winter Berg Winds in the Garden Route. A previously notable period of prevailing Berg Winds in the Garden Route was from May 1995 for six weeks. The mechanics of a Berg Wind are simple. As air descends from altitude, in this case over the Outeniqua Mountain Range, it heats up to approximately 32°C, but can be as high as 38°C. In addition to being hot, the air is extremely dry. These hot dry conditions played a major role as a predisposition for the fires of 7th June. In the preceding week there were two days of Berg Winds which dried and wilted vegetation in the area. This, added to the extra layer of defoliated material as a result of the drought, prepared ample fuel that required a simple spark to ignite it. Something beyond all human control is the speed of the wind. When a barometric chart indicates a large pressure differential, then expect strong wind. On the 6th June, the barometer started dropping from 1024mb at 00h00 to approximately 997mb by 15h00. Accounts of how fast the wind was traveling on the 7th June vary, but it was recorded at between 90km/h and 100km/h with gusts exceeding 110km/h, strong enough to divert one aircraft from landing at George Airport and to close the airport till the late afternoon. Like a bellows, winds of this speed can fan a fire and superheat it more than 2000°C which is exactly what occurred on the 7th June 2017. Add all the above conditions in with the strong wind blowing from the north west and you have the makings of the perfect fire and the creation of a phenomena known as a Thermal Wave. Referenced in literature and rarely seen, a thermal wave is a sine wave flow of super-heated air associated with a fire. Heat from the fire rises, while the wind blows it horizontally before it touches down and ignites a new fire and then again bounces off downwind. The wave length of this thermal wave can vary between 300m and 1000m allowing it to jump over valleys and rivers and resulting in the seemingly random effect of single houses exploding into flames while those around them are left unscathed. The mechanics of the thermal wave are interesting. The superheated air rises from the flames and moves laterally driven by the wind. As the air descends into the trough of the wave (of the sine wave form) the high temperature heats everything before it, be it trees or a structure, which then erupts into flame spontaneously before any flame reaches the area. When this wave descends on a structure like a house, it forces the roof down with immense pressure while the extreme heat melts glass and disintegrates bricks. The result is a collapsed pile of rubble. Eye witness accounts of this leading edge of the thermal wave describe it as a rolling ‘tumbleweed’ flying through the air at between 100km/h and 110km/h. One account even related how the fire overtook their car at 110km/h. The area beneath the peak of the thermal wave has been described by Knysna Fire Chief Clinton Manual as being beneath the ‘dome’, a smokeless zone of earie silence and no wind. In the Garden Route, during a few days starting on the 7th June, we lived through a historical event, another which has only ever been recorded in1869. Nothing could have prepared us for this fire and nothing could have combatted it. It was the perfect fire, a combination of factors which fuelled the inferno. Fortunately we have learnt from this event and can formulate plans never again to allow Mother Nature to play a Royal Flush of all five contributing factors to produce a thermal wave through the Garden Route. We cannot prevent droughts or stop the Berg Wind or retard the wind speed, but we can manage the fuel load of the region and establish corridors of fire retardant vegetation and plan a mosaic of safe zones. ARE YOU A LOCAL BUSINESS OWNER? Would you like to see change in the Knysna business community?